Maud and Dracula. A possible romance...... (Thought these two would be good together. To add डिज़्नी to it, there is a hidden Mickey. Not hidden real well.). 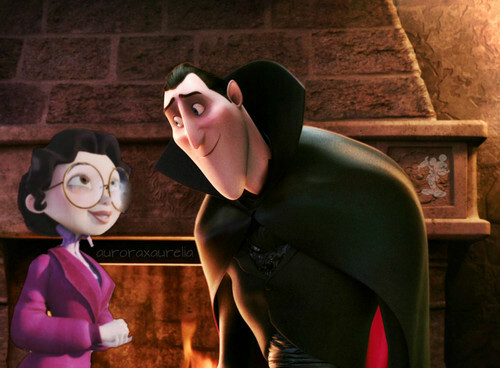 HD Wallpaper and background images in the डिज़्नी क्रॉसोवर club tagged: photo disney crossover non disney sony pictures animation dracula hotel transylvania a monster in paris maud hidden mickey. This डिज़्नी क्रॉसोवर photo contains फेडोरा, महसूस किया टोपी, homburg, स्टेटसन, trilby, टोपी, होम्बर्ग, स्टेट्सन, त्रिलबी, fedora, लगा टोपी, and stetson. There might also be हुड, डाकू, मांझी, लिवोमो, पनामा, पनामा टोपी, नाविक, पौना, पुआल टोपी, बोएटर, लेघोर्न, पैनामा, पैनामा टोपी, स्किमर, स्ट्रॉ टोपी, मांझी का, लिए, भूसे टोपी, wimple, and लुप्त हो जाना.